Programme valid from 1st April to 31st December 2011. The 5x reward points are subjected to maximum spending of RM1,000 for shopping/groceries/mall and RM1,500 for overseas hotel/dining per calender month. If spending exceeding this amount, only 1 reward point will be awarded. Points will be credited 6 weeks after end of calendar month. The annual income requirement for the HSBC Visa Signature is RM100,000 and annual fee will be waived with 12 swipes per year. 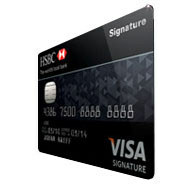 For more information, kindly browse through HSBC VISA Signature webpage.